Oberon Fuels uses two standard production units to produce DME fuel for its partners. Utilizing the same core process, units vary depending on the feedstock used and can be configured to produce DME or methanol. Rapid deployment can easily accommodate growing vehicle fleets. If you are interested in using DME as a fuel, or have feedstock that you would like to convert, contact us to find out how Oberon’s technology can benefit you. 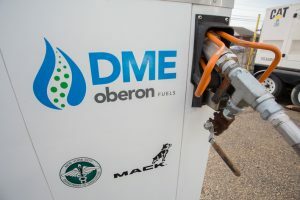 Oberon Fuels’ commercial demonstration plant in Brawley, California (2 hours east of San Diego) is producing the first fuel-grade DME in North America, which is currently being used by Volvo Trucks, a division of The Volvo Group, in its commercial demonstrations of DME-powered, heavy-duty trucks. In addition, as announced in September 2015, Oberon has also partnered with Ford, FVV, and various academic institutions to build the world’s first DME-powered passenger car for on-road testing in Germany.